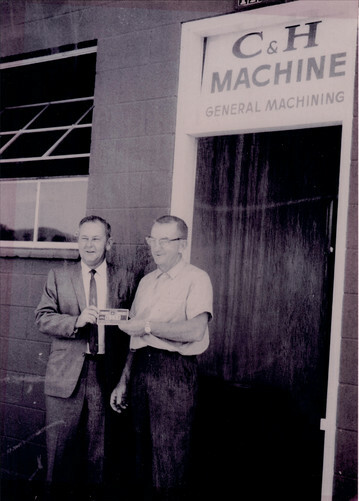 Carl and Helen Warmelin, founders of C & H Machine, started their first machine shop in their garage in 1949. As the company grew, they operated in several locations in the Los Angeles area. In 1963 they sold the business and relocated to Escondido, California where they started C&H Machine in 1964. In 1967 Carl hired Charles “Chuck” Gohlich. Chuck started as a trainee and in 1971 received his Journeyman’s Certificate from Mira Costa College. In 1975 the Warmelins sold the machine shop to Allen Burwell who incorporated it as Merit Industries and continued doing business as C&H Machine. With sale of the business Carl retired and Chuck became Shop Manager. In 1981 Lyle Anderson, a graduate of Southern Utah State with a Bachelors degree in Business Administration, was hired as Sales and Office Manager. In December of 1985, Merit Industries was purchased by Chuck and Lyle. C&H Machine changed dramatically for the better in 1987 when it acquired Rolo Instrument Products. The dynamics of the combined sales and expanded Customer base vaulted the company into a strong era of growth. In 1992 C&H purchased Support Equipment (SEI) and in 2005, Quality Machine. Both acquisitions increased our capabilities and expertise along with further broadening our customer base. In January of 2010 C&H Machine joined Suppliers of Excellence Alliance (SEA) to help eliminate waste through Lean Manufacturing. In 2011 C&H became certified to AS9100:2009. C&H Machine is committed to Customer Satisfaction through continuous improvement.